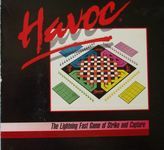 HAVOC is a revolutionary game that will delight you. On a brilliantly designed board, players attempt to out-maneuver and capture their opponents in a frenzy of movement and deception. Prepare yourself for a game as versatile as you are! From back of the box.